The Fourth of July is around the corner and us Americans, me included, definitely like to be patriotic! So what is better than sporting your Red, White, and Blue on Independence Day? I rounded up some great items that will not brake the bank on this holiday. Jumpsuits are all the rage right now and this one is perfect the celebrate this day. Dress up any outfit with some earrings, these are my favorites here. Who doesn't love Off the shoulder shirts....which go great with jeans are cropped pants. Hats are great for outside BBQs to block the sun. A comfortable polo dress is always on rotation in my closet. 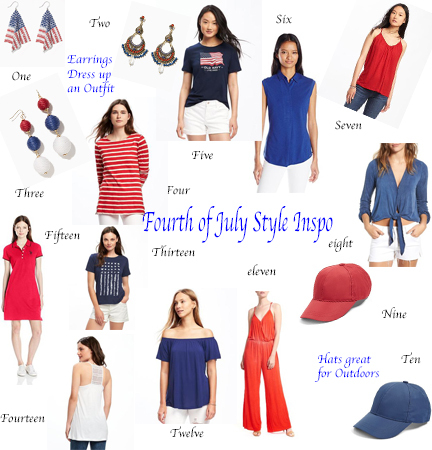 What are you planning to wear on the Fourth of July? Shop some of my picks below.